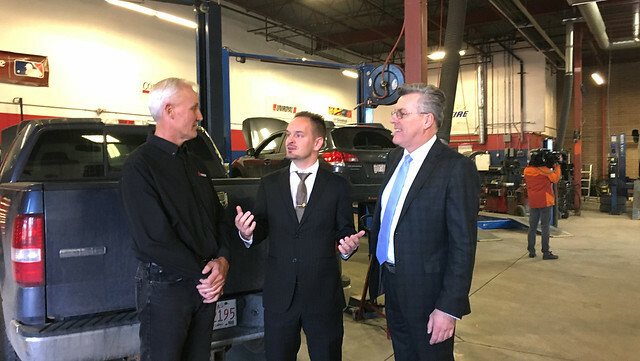 New rules for vehicle sales and repairs introduce industry-wide standards to protect Albertans and improve business accountability. Minister Malkinson, centre, with AMVIC board chair Bill Burnett, right, and business owner Ted Zylstra discussing new consumer protection rules. Improvements to the Automotive Business Regulation will create consistent standards to help consumers make more informed decisions and ensure businesses can compete fairly in a trusted automotive marketplace. The new, industry-wide standards come into effect on Oct. 31, 2018. During the 2017 consultation on consumer protection laws, Albertans identified the need for better protections when buying a car and more transparency when it comes to auto repairs as top priorities. Inform buyers of the history and condition of a vehicle such as the vehicle’s previous use, ownership or details of any damages. Provide a comprehensive bill of sale document at the time of the car sale. Provide written estimates upon request and get consumer’s consent before starting any work. Remove any outstanding liens on a vehicle within seven days of the sale. Remove any advertising about a sold vehicle within 14 days of the sale to ensure consumers are not enticed by low prices that won’t be honoured. The new rules also support the government’s work to build stronger public oversight of the Alberta Motor Vehicle Industry Council (AMVIC), by transitioning AMVIC to a public agency. This will ensure Alberta has a strong and trusted regulator that is well-positioned to protect consumers and build integrity in the industry. In December 2017, the government passed A Better Deal for Consumers and Businesses Act. Among the many changes introduced through this act was an increased authority to strengthen oversight of the automotive industry to better protect the interests of consumers and ensure integrity in the industry. AMVIC is responsible for providing consumer protection in the motor vehicle industry. In addition to licensing businesses and salespeople and ensuring there’s a fair marketplace for consumers and businesses, AMVIC is responsible for investigating violations of consumer protection laws. AMVIC will transition to a public agency on Oct. 31. Once in place, AMVIC will be subject to the requirements under the Alberta Public Agencies Governance Act to ensure consumers and industry can have confidence there is strong public oversight of the organization.